My final weekend along the Oregon Coast now behind me, it is time to once again find a place to anchor for the work week. 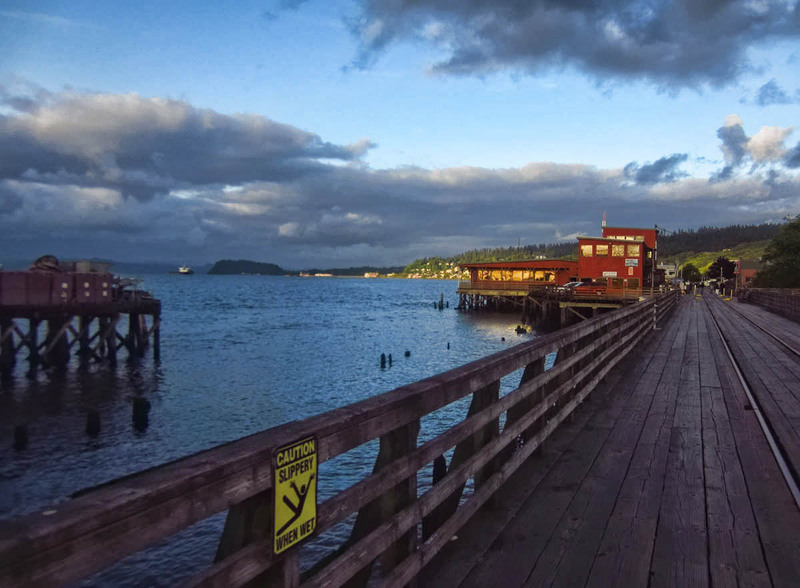 The little town of Astoria, “oldest American settlement west of the Rocky Mountains,” looks like the perfect spot to spend the week exploring before pivoting east. But the only campground I am able to find is the fancy “Lewis and Clark Golf and Premier RV Park.” There is nothing in that name that sounds anywhere remotely appealing to me. Besides, after just having signed the invoice for a whole lotta solar, the last thing I want to do is pay $40+ a night for full hook-ups. I see there is a county park in nearby Clatskanie, so I set my sights on the 30 mile drive eastward. But in my typical MO, it is already 7:00pm on a Sunday evening. As I am driving through the town of Astoria, I see so many interesting places! I feel remorseful about not being able to stay here, but I figure it’s only 30 miles away, I will drive back one or two nights to explore. Just as I have reached the outskirts of town along Highway 30, out of the corner of my eye, I catch a glimpse of a group of RVs spaced out in an open parking lot. I am going way too fast to stop, so I look in the rear view mirror to see a small sign on the roadway that says “RV Park.” I find a place to turn around, which is no easy feat while towing, but I figure if I can find a place to stay in Astoria, it will be worth the effort. I find it odd that this RV Park has not appeared on any of my google searches, Allstays, or RV Parking apps. A little “twilight zone-esque.” I pull into the strange RV Park/Junkyard, and there is no one around. Rigs here range from a fancy new Class A with a shiny new convertible VW Bug toad, all the way down to rigs that are so far from being mobile, they are covered in moss and vines. I am a bit tentative at first, as the place makes the Dixie Kampground look like a resort. But the more I start to explore outside my “circle of comfort,” the more I see I have landed in a gem of a parking place! Just behind me a few steps is an inviting paved bike path that runs the entire length of town. And there is a Rogue Brewery Public House, not much more than 100 yards from my door! The more I explore of Astoria, the more I fall in love. At first, it appears to be just another small town along the waterfront. But after spending a few days in this charming place, I soon discover it is a wellspring of entertainment, attractions, and outstanding eateries. 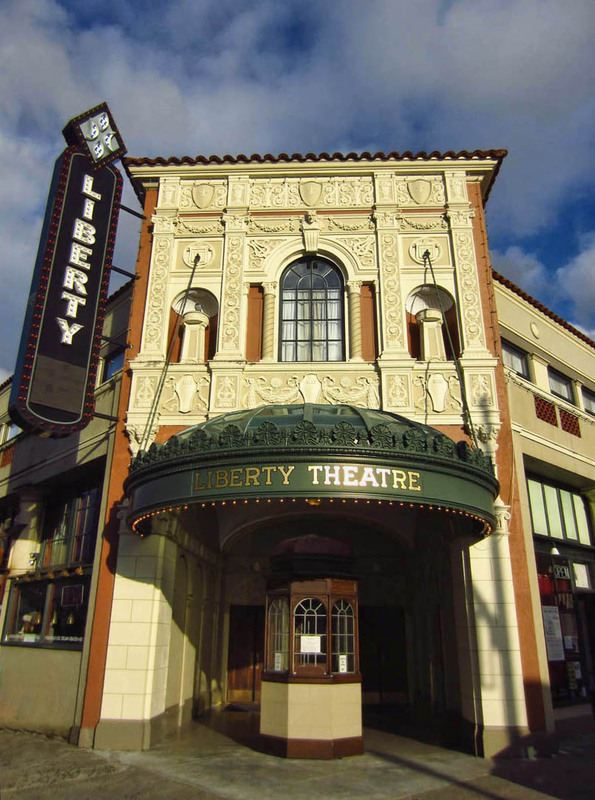 There is a music festival going on at the refurbished Liberty Theatre. 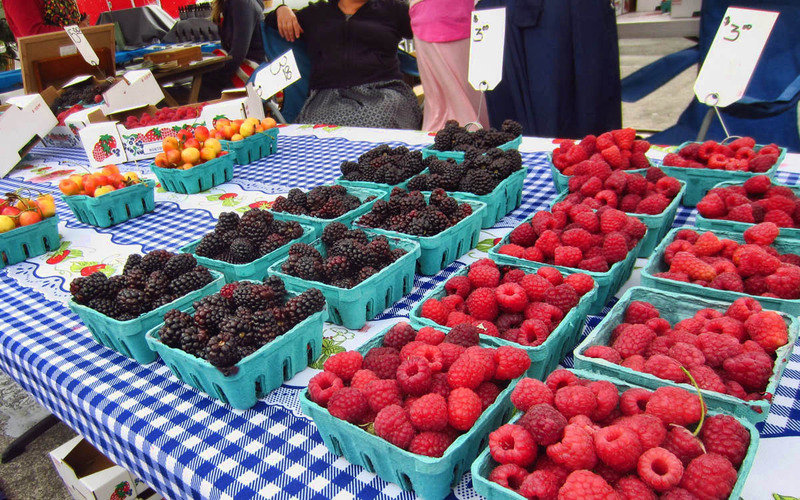 Funky farmers markets twice per week. An expansive Maritime Museum, complete with historic lightship. And enough affordable dining options to rationalize another week of not cooking! Where to begin? I also surprised myself by spending almost two hours in the Maritime Museum. I am not typically a “museum person,” but being a lover of all things related to the sea, this one held my attention until the last call for all visitors to please leave now. 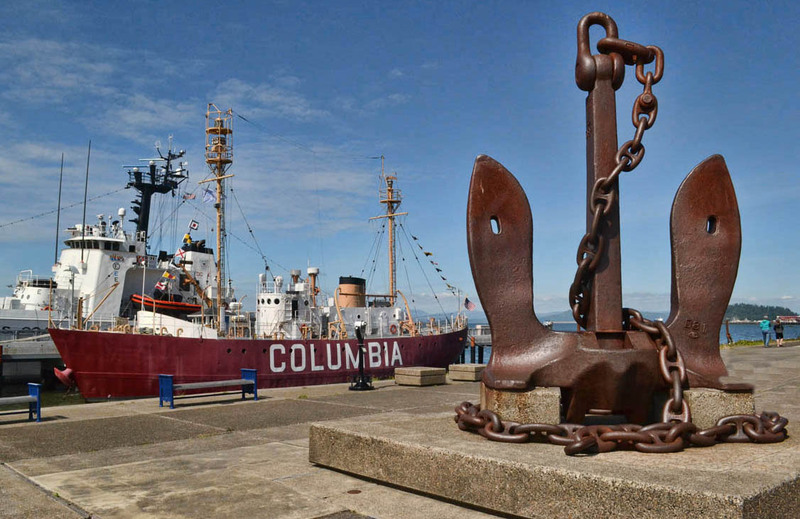 I loved touring the crew quarters, galley, and wheel house of the Columbia Lightship, a “floating lighthouse” that served as a navigational buoy six miles off the entrance to the river. 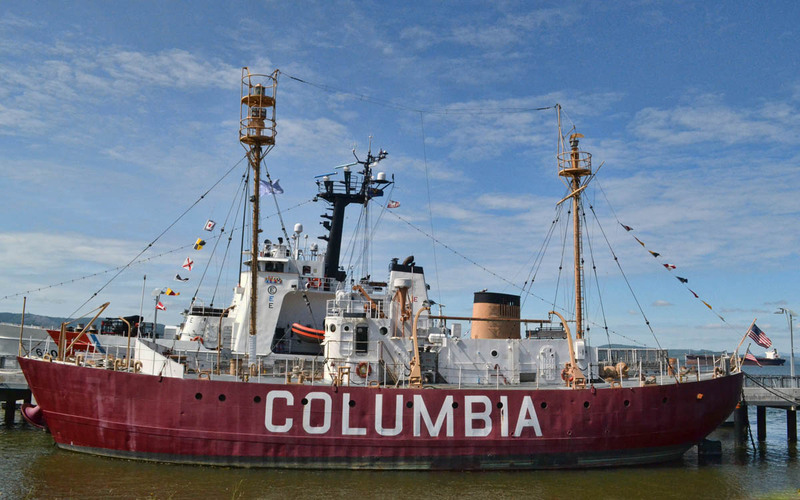 The Columbia was the last active lightship along the west coast, taken out of service in 1979. 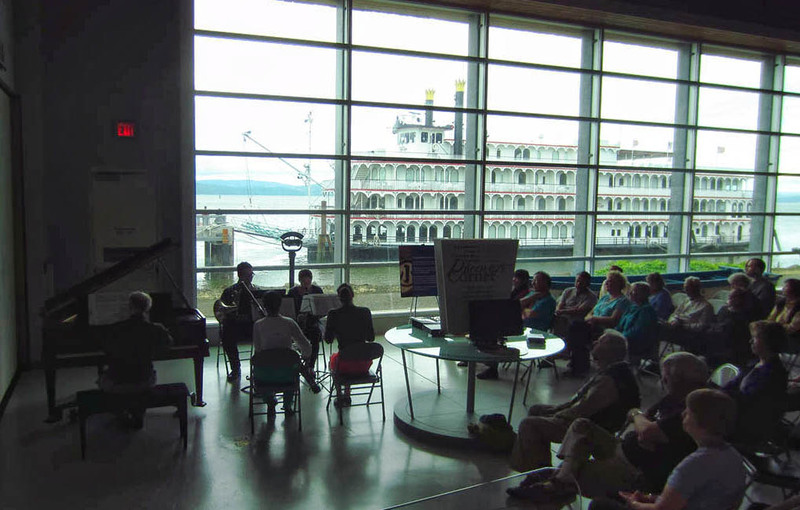 Visit to the Maritime Museum was accompanied by a nice live classical performance. 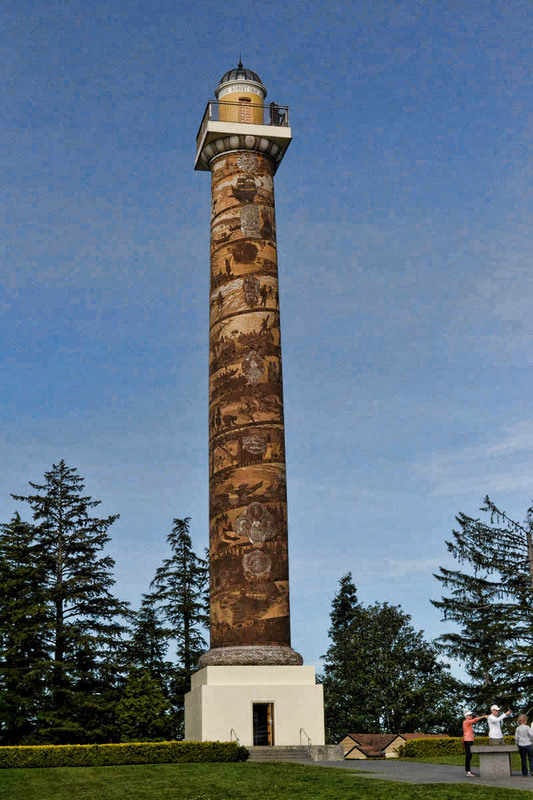 Astoria’s famous “Column” gives the city a bit of a mini-San Francisco feel, as the steep, curvy streets leading up to it could rival those of Lombard Street. The views of the Columbia River and its tributaries were worth the 163 spiral steps to the top. 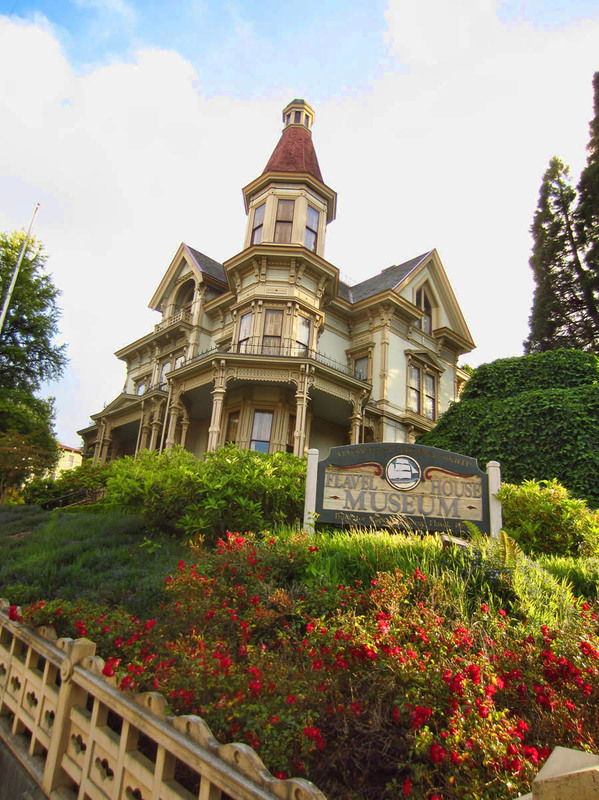 Built in 1926, the exterior is covered by a mural depicting significant milestones in Oregon’s history, such as the “land marking” of the Columbia River (I won’t say “discovery,” because the Native Americans had already discovered it,) and the Lewis and Clark expedition. So I can’t talk about Astoria without mentioning the plethora of interesting, eclectic dining options. Of course, there is everybody’s favorite, Bowpickers located in a gutted-out gillnet boat. How odd that I went there for the first time one afternoon, completely unaware of my good fortune to find only one person in line! Every time I tried to go back after that, there was at least a 20 minute wait! Here you have but two menu choices; A whole order of beer battered, albacore tuna fish and chips, or a half order. The only thing easier than ordering is enjoying! A little more upscale options included Clemente’s, which had an excellent wine pairing for each menu item. A delectable splurge! 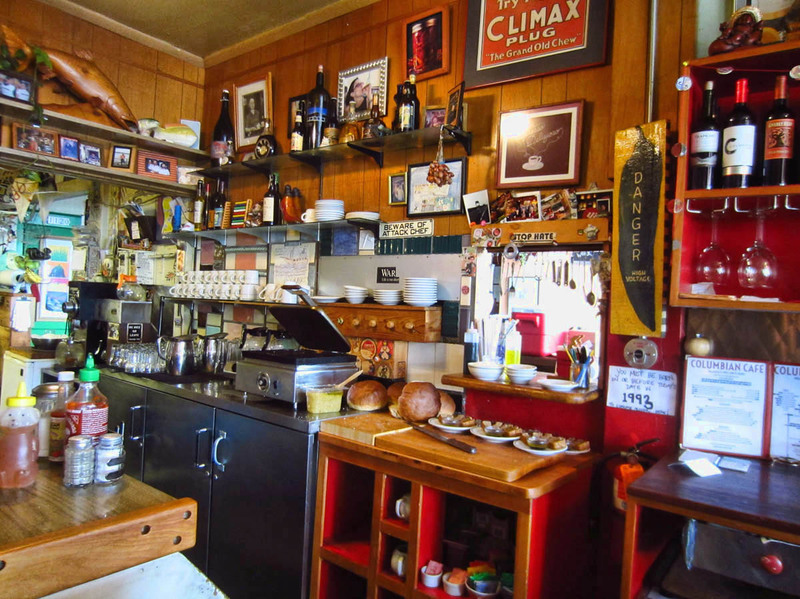 And the crazy little Columbian Café, where I sat at the bar and watched the chef prepare my entire eclectic, delicious dinner on a breakfast grill. Had it not been for the Wheelinit blog, I would have missed this charming gem of a spot, which turned out to be a favorite. 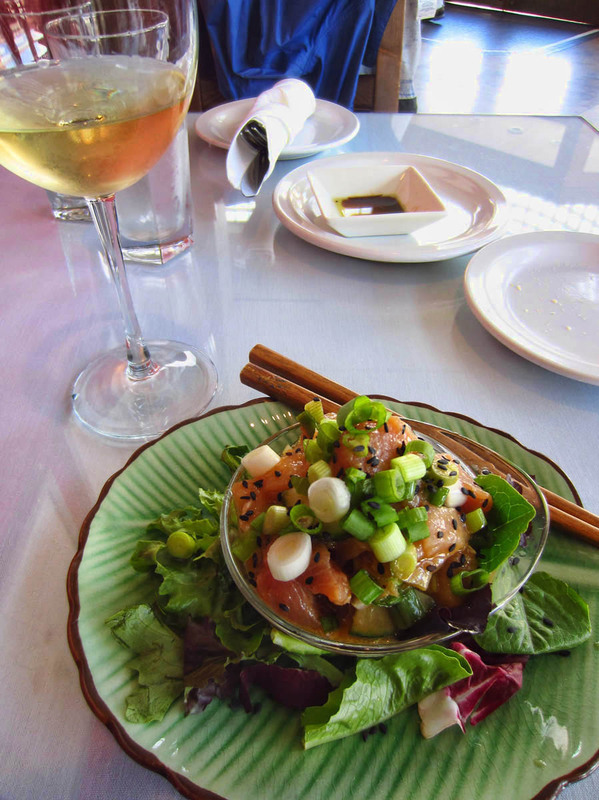 Poke from Clemente, local sashimi grade Albacore in a sesame soy, ginger and cucumber marinade. 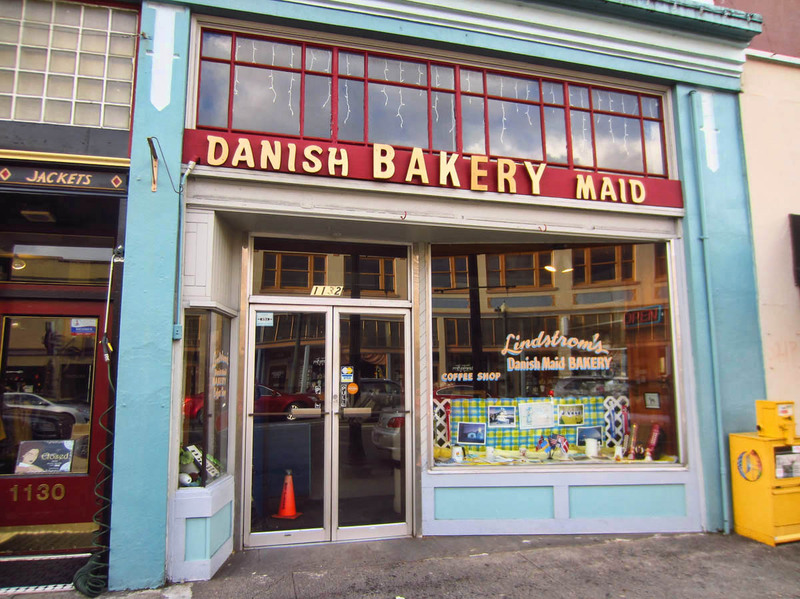 But maybe my favorite part of Astoria was the oddest of all….its smell. 😉 There is something about that “deep well aroma” of river water when it meets the sea. I have only smelled it one other place, and that is at the tip of my beloved Manhattan, where the Hudson meets the upper Bay of the Atlantic. I learned to sail by following the direction of that scent, and it brings back of flood of good memories with each breath. 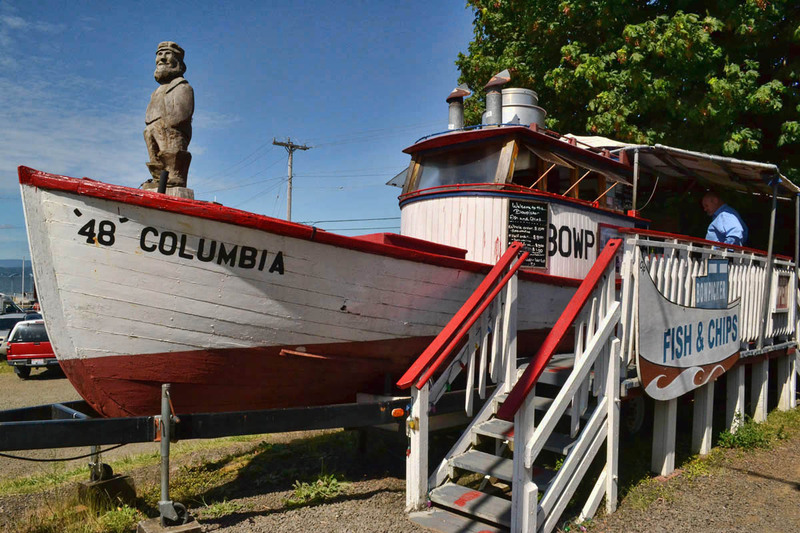 This entry was posted in Oregon and tagged Bowpickers, Columbia Lightship, Columbian Cafe, Maritime Museum, Rogue Brewery by Suzanne. Bookmark the permalink. Seeing your lovely adventures here for me induces excitement for you as well as a bit of melancholy for me, recounting the many years I’ve spent in my native Texas while struggling to find even a hint of what you have discovered somewhere locally while touring the next new prefab shopping mall or catching a sunset over the silhouettes of gas wells as I gaze through the haze of the nearby cement plant, steel smelter, coal plant, oil refinery or dust storm brought with our West Texas wind. Glad you are nearing utopia. Wish I was there!!! 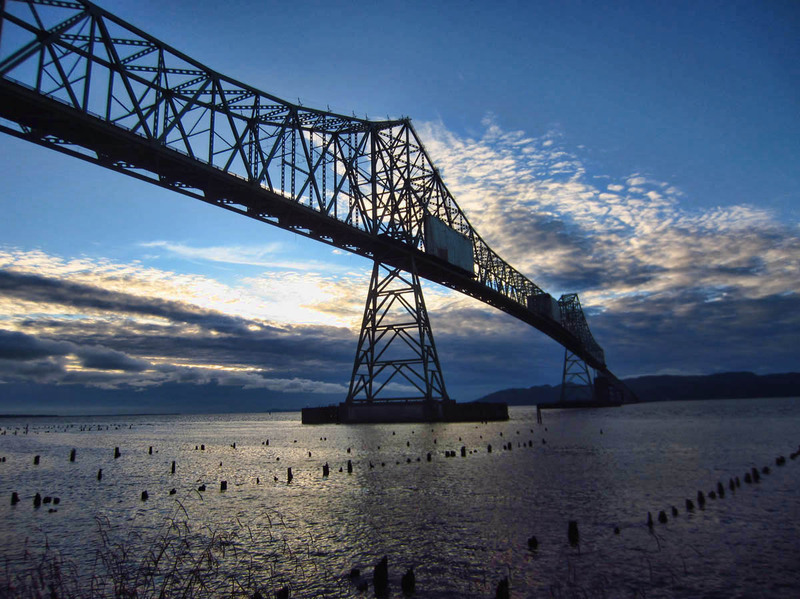 How astounding that we would blog about Astoria at almost the same moment! Fabulous photos and your post makes me want to stay longer. I was thinking I’d see the column today but the fog is pretty thick at present. And Bowpickers (about 20 paces from my overnight spot; I can keep an eye on the line) opens up again tomorrow. What a great town. 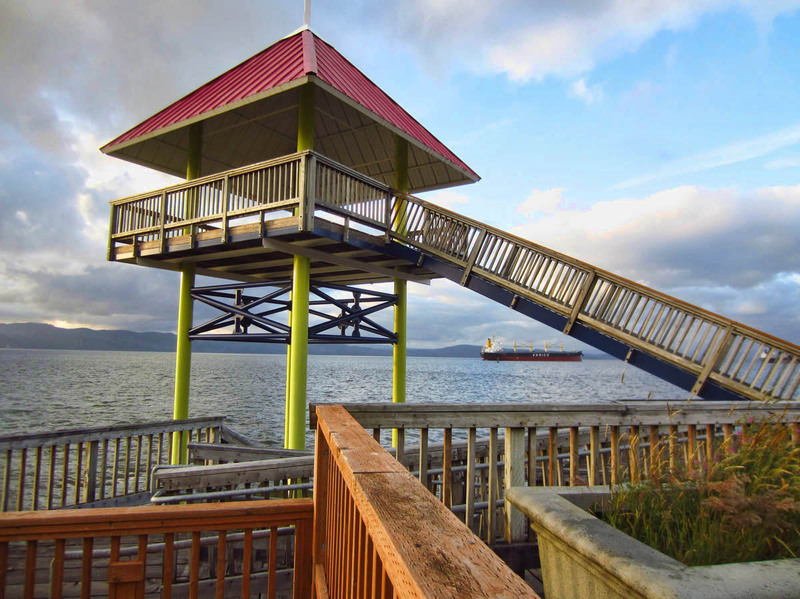 What a GREAT roundup of Astoria. And amazing pics too!! So with you on everything about this town. Our plans for that area end of August take us a bit of a distance from Astoria I believe…which means a day trip to whet our appetite and a return trip sometime to explore in depth! Looks like a wonderful place to spend some time. I told BJ that Astoria deserved much more time than the couple afternoons we gave it and you just proved it. We’ve got nearly a month left on this trip and I’m already making a list for our return! As usual, your pictures and prose are a delight. After traveling the country sea to sea, I came to the conclusion that if I had my life to live over again, I’d live it in Astoria. Great post. Thanks for the memories. Super dooper that your solar is already providing a 50% discount on your spot. Too funny that your upscale park was the same price as the quirky one. Glad you tried it. Wonder if I would be that brave. You definitely have a knack for finding great spots, great food and taking great pictures. Astoria is now doubly added to the list Nina started. 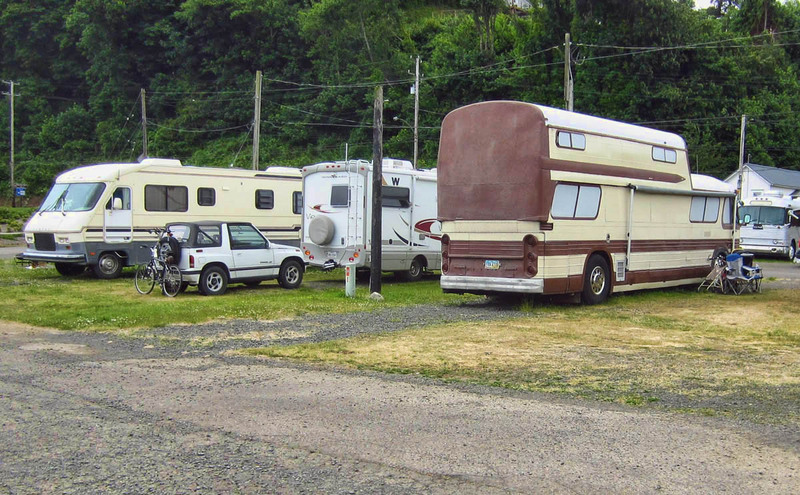 The RV park looks like something out of a staged movie set. I could see a little hint of embarrassment from your little Winnie, saying “my mom made me do it”. I have traveled through Astoria many times, but you have given such an interesting (new) view of it, I am putting it on my must see list. Pick up my new Winnie tomorrow, can’t wait to get on the road. Thanks for all your wonderful, informative blogs. Terrific! But, ooh. That velocity. 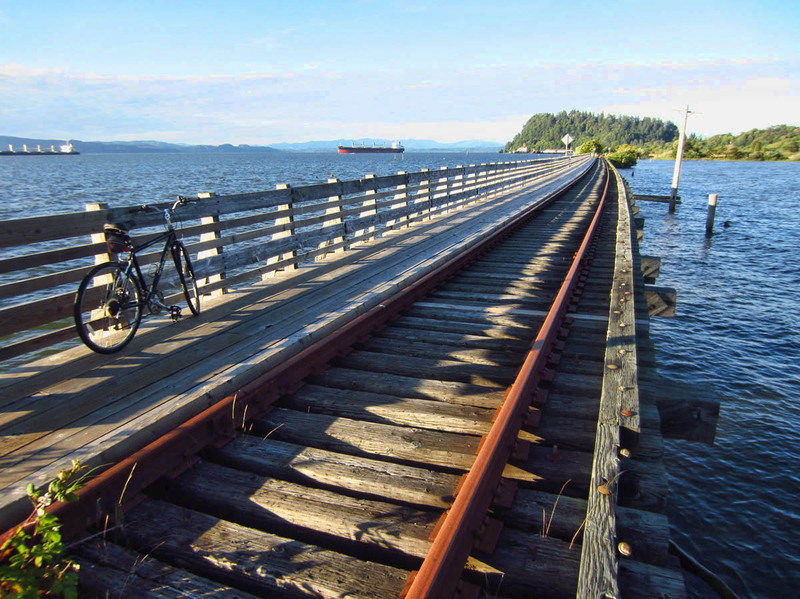 We love Astoria, visited there quite a while ago and looks as though it should move up a couple of notches on the bucket list. I loved that Bridge over the river. Deede’s aunt lived just across on the Washington side when visited. I loved your description of the price negotiations with the RV park manager. Great scenery, things to do and food. The pictures and prose were as always. It looks really interesting there with lots to do. That RV park looks a bit daunting!!. Wonderful meals there too by the look of them. You really nailed “it” in this article. You are in our neighborhood and we have endured great career disruption to live here. We love it and will never leave. For people thinking about quality of life, I give you this in addition to the fun and fare- Astoria is far enough inland to escape the persistent marine layer for most of the summer. Our winters are mild also. 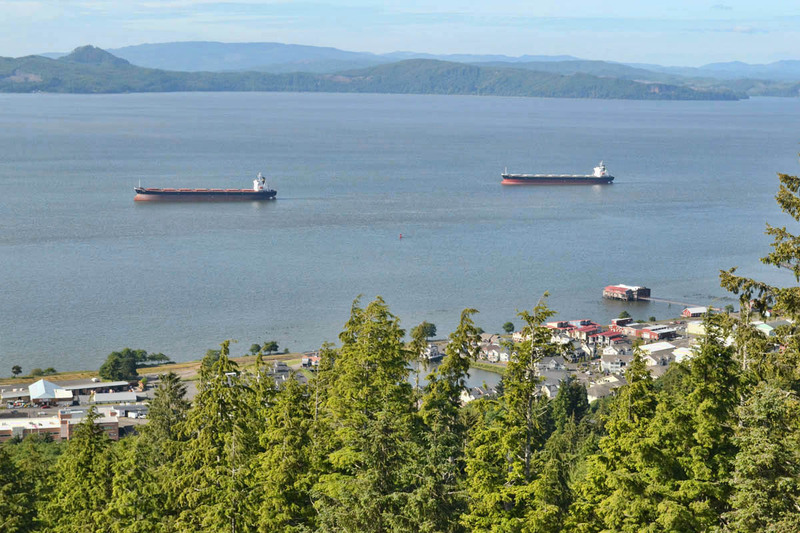 We are within walking distance of forest trails, and a short drive to the beach itself. It is to me like a perfect Nirvana and more good people are doing more interesting things each day. You have missed one of my highlights, Fort George brewery, an epic homage to brewing a wide variety of incredible beers served with a great selection of food some of which comes from the wood fired oven. The people here are fantastic. Welcome to Astoria. What a fantastic start to the day. It’s 5.30am in the UK and far too early to get up, so I thought I’d browse my emails. Our good friend Ellen Whitten , who has a home in Astoria, has posted your blog. We’ve visited Ellen and Andy three times and LOVED the place. I’ve just read every word you’ve written and admired every photograph. It’s as though we were back on holiday again. Thank you so much for such a thorough review. I can’t wait for my husband Richard, to wake up so I can show him too. Great photos!!! We’re pretty proud of our town (tho I live out of town in Brownsmead!) and hope you’ll return and enjoy some more of our great community!!! For instance, we have an excellent community radio station – KMUN. The Fort George Brewery and Public House is fantastic, with the Blue Scorcher Bakery on the same block. The Shallon Winery has some very unique wines to sample and you’ll enjoy Paul VanDerVelt’s commentary on each type. 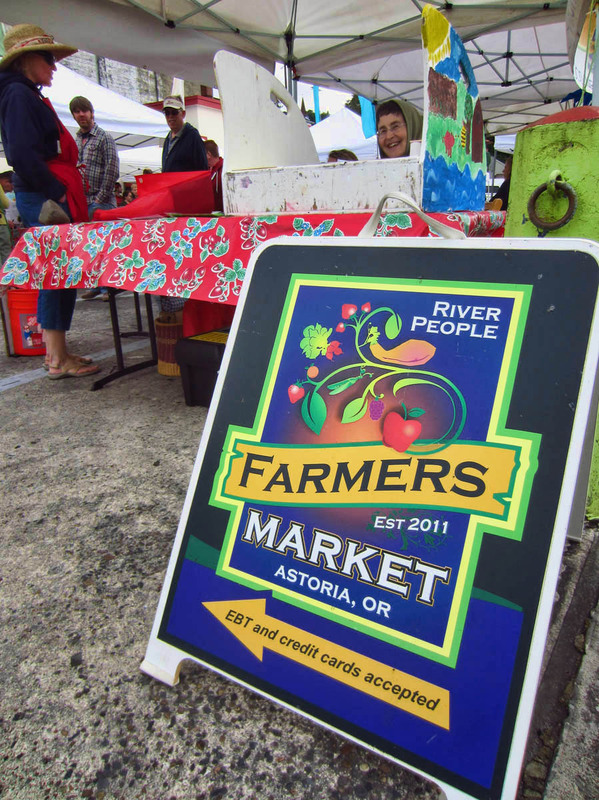 There are some amazing musicians and artists in and around Astoria – always something fun going on!!! Hope to have you visit again – SOON!!! I love seeing these posts about my home, Love it so much! I had to post and tell you that there are two large RV parks out by the beach. Fort Stevens and there is a KOA. I loved your post about Astoria. It made me miss my hometown so much more. I moved away from there 18 years ago. And can’t wait until I get the chance to travel back. There always seems like there is something new to explore each time one turns around. Thanks for sharing. Enjoyed your adventure. My first trip to Astoria was in the spring. Daffodils were growing every where and being sold in road side stands. As I came over the Youngs River bridge, I too fell in love with Astoria. I lived there for a while and it still holds a special place in my heart and it is the home of many people that I love. I am so curious to know how you all came to find the blog? Did someone cross-post my Astoria post to Facebook? I have a pretty small “audience,” so I would love to know how you all found the Astoria post. Wow, I accidentally discovered your blog and I am blown away at how you have grasped the essence of what Astoria is in just one week. Those of us who live here full time know the wonders of which you speak but so few people visiting take the time to really experience it. It is easy to drive through and make the judgment that things are a bit run down. But if you give yourself time to explore and discover the area then you will begin to understand why so many of us have chosen this as home. I think I love most of all your comment about the smell of the river! I LOVE that smell and I too recognize that it tickles some far distance memory for me. 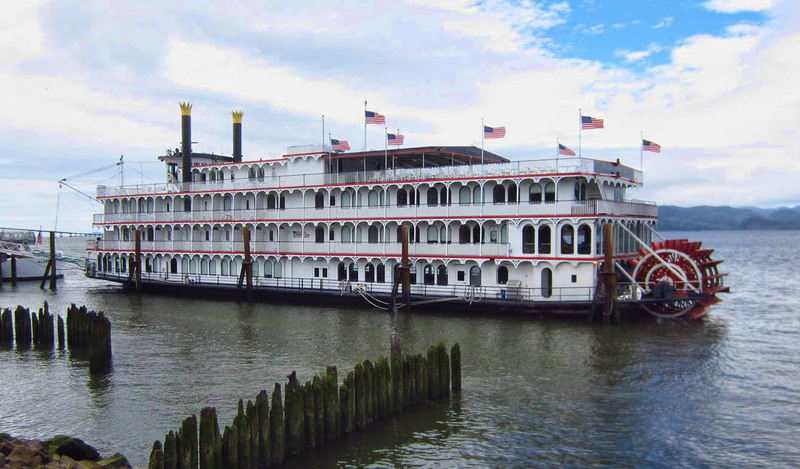 In celebration of this place and the Columbia Pacific, we create a magazae called “Our Coast”. We are on volume 3 and working on volume 4. I will be happy to mail you a copy if you reach out. Or you can go to discoverycoast.com to see an e-editon of the magazine. Please come back…there is more to see and experience! We really enjoyed reading the post, seeing the pictures, and reading the comments. We have been to Astoria many times because we have family there and always drive from Wisconsin and camp along the way. 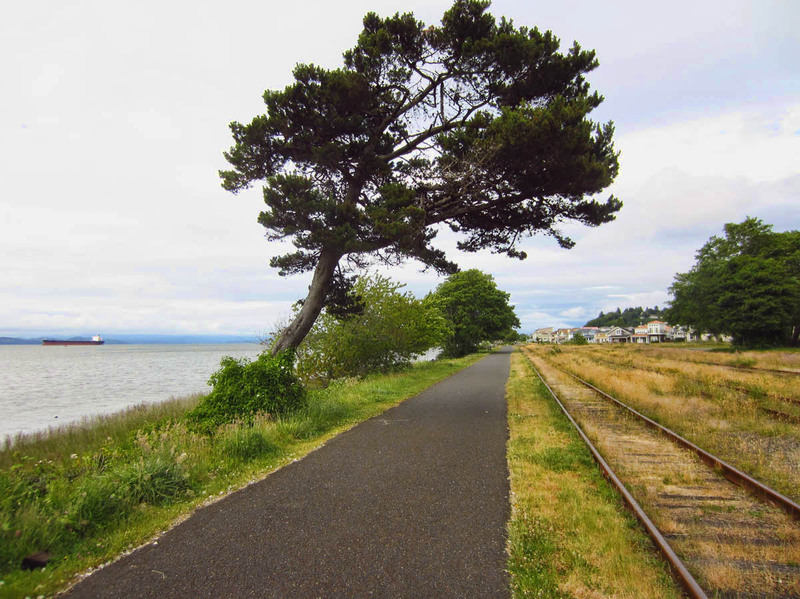 When there, usually stay at Fort Stevens, but because we needed to stay in town to help out for two months we stayed at the Pier 38 RV Park mentioned and it was a great location , fit our purpose, was nice, and right on the River! Heartily agree with all comments on sites to see, things to do, and places to eat!! Absolutely wonderful post! and to answer your question, yes I saw your post listed on Facebook by a friend I grew up with in Astoria. 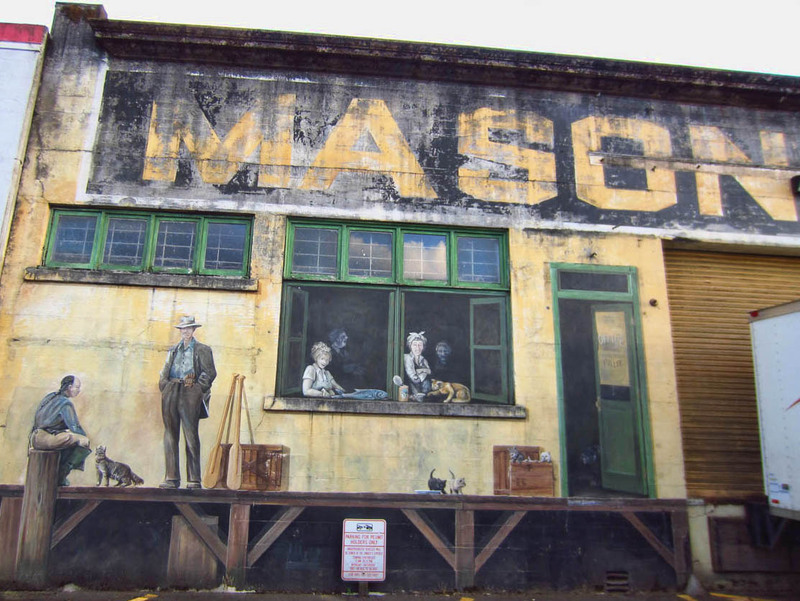 You truly have captured the quirkiness and raw edge to this little gem of a town. We all love it. I haven’t lived there in 30 years, and now live on the East Coast – working in NYC. I guess we’ve switched coasts. At least for the moment. Very nice blog about my hometown! I really enjoy someone shedding some light on all the beauty there is to experience from the museums, to the theaters, bike paths, and eateries! Astoria needs more positive feedback not just from a developer perspective, but from actual visitors experiencing all there is to offer! The pics make me miss it! I discovered your blog when Finnware Astoria posted your link to Facebook. Thank you for loving our little slice of heaven. We love it,too! I much enjoyed your blog, the great pics, and adventured tales of the RV park. You missed a wonderful treat though, the Astoria Riverfront Trolley, “Old 300” … much is written about her as she clangs, and dings upon those old rails along side the river walk. The best one dollar sway through history anywhere all delivered by volunteers. We’d.love to have you back! I moved here almost 30 years ago and love this place. The best comment was the smell. I love that, too. Smells like home now. I moved to Astoria 8 years ago from California ,& have never looked back, because of all the things you posted here. Im glad you loved it as much as we do. That RV park doesn’t look all that great, but it’s right next to the Columbia River & in walking distance to all the great places to visit in Astoria. Please come back to see us! 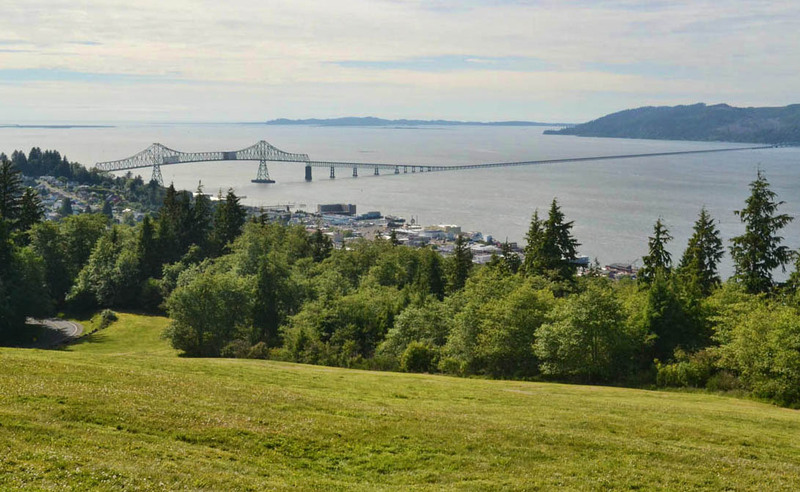 Love your article on Astoria. As a 3rd generation Astorian, I often don’t appreciate this area. My favorite part of Astoria is the Mighty Columbia River. My dad was a tugboat captain and would take us out on “ship jobs;” pushing ships into the Port of Astoria, which was a bustling port in the ’60’s. After living here 52 years my husband and I decided to buy a 2nd home in the high desert in central Oregon. We now have the best of both worlds! When you come next time, PLEASE try Drina Daisy. It’s this little place, right after you make the J-curve into town, on the right. She cooks “Bosnian comfort food” and it is incredible!!! Also, the theater attached to the Columbian Cafe is what we call “the cheap theater” around here. $4 a ticket for adults, and you can watch the movie and drink local beer from the balcony, or get a pizza. The Astoria Aquatic Center offers day passes for pool use, a workout in the gym, and full locker room privileges (which might help keep your water tanks fuller longer). Fulio’s has the best steak in town. The Mexican place across the Old Bridge is amazing. You saw a lot, but you missed a lot, too! You definitely get our little sweet town, so different from what lies south of us…everyone’s comments are just right on! I understand why our children choose to eventually come home and create rich, exciting, fulfilling lives. Oh, here’s to you for naming the sweetness of the “deep well aroma”!!! So glad you got to visit! My husband and myself are native born Astorian’s (true goonies who live at the goon docks!) who have lived our entire lives here. We love it – this is “home”. Come back and enjoy! We have so many beautiful places here & the people are equally beautiful & very friendly. Thanks for the visit and please come again. I really enjoyed reading this blog entry. Such great comments as well. I am so proud to be an “NBA” (natrual born astorian). Safe travels to you ! You posted as to how this Blog was found. Well, it is being circulated fairly widely at present. A friend of my wife (both quilters, that is they quilt and email!) have been sending this through the “Internets”. I received it tonight and passed it along to some friends in Portland and Europe. You did a commendable job “getting it” in a short stay. I believe most folks feel the same. 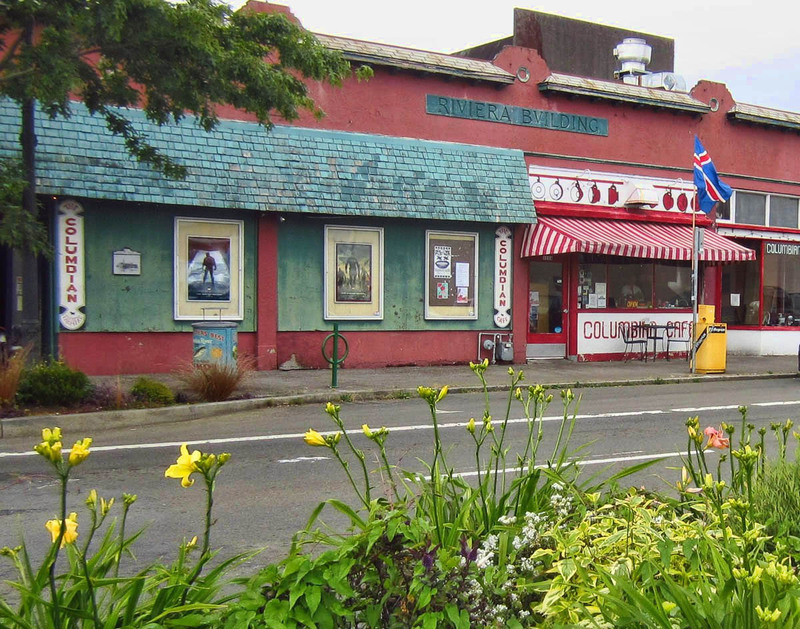 For what appears to be “just another small town along the waterfront.”… it is anything but that. There are many adventures here. I grew up in Astoria. Though I’m now 600 miles away (ah the compromises we make when we marry!) I hold a piece of it in my heart. Thank you for capturing not only the ‘new’ in my hometown (things are a lot more upscale than they used to be in my years of growing up amid super active fishing and logging)- but the heart of Astoria, which is it’s rich history, beauty (both classic and eclectic) and warmth. Growing up I wanted nothing but out of that small (and to me then stifling) community. I never thought I’d even remotely consider wanting to return.. but now I wish I could. Like you, my ultimate favorite.. the very air! Again, thank you for a marvelous entry, may your continued journey be blessed beyond measure! Our cousin Diane lives in Astoria and emailed this fascinating description of her little town to us. My wife and I drive up H/W 1 from the San Francisco Bay area to visit her on occasion,….so we have a personal tour guide with cousin Diane. She’s a history buff and has a wealth of historical fact’s and tidbit’s of the area (and even some interesting local gossip…;)). They have lived there for many years, she’s widowed now and her husband Bill, was a commercial fisherman. She’s taken us to several of the eateries and site’s around town…Can’t wait to go back!! Thanks for the excellent photo’s and critique of this “Diamond In The Rough” in our Great North West. 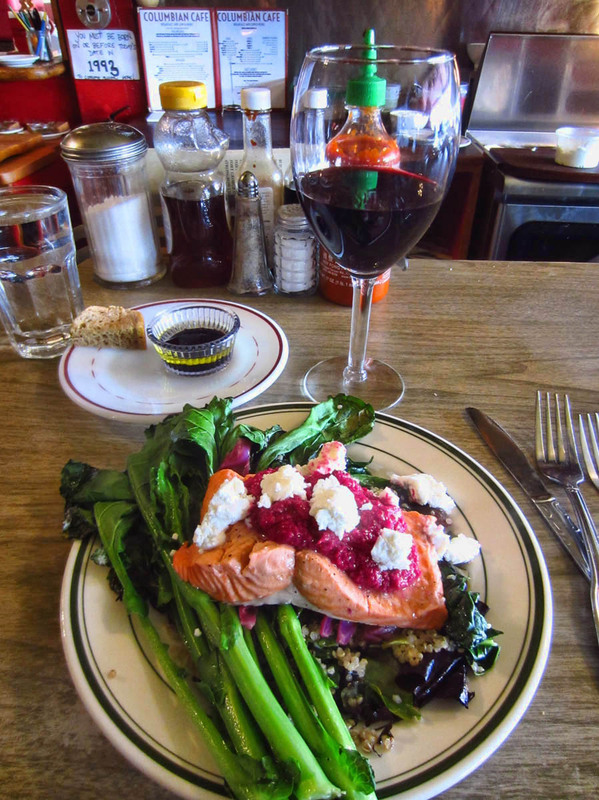 Enjoyed your blog on Astoria! Living across “the river” (in WA) but spending most days there the past 30 years, I had never thought about “the smell!” You got a very good “taste” of this place and translated it well, but you’ll need to come back and finish up! Thank you. Please come visit any time! Our park has been cleaned up a good deal since then. I hope all is well and you have great travels! Oh, also the only thing I had issue with, if my trailer isn’t ramshackle! Just needed a bath! 😉 be well my friend. Nice job on capturing the essence Astoria-I lived there for 25 years and it has and is undergoing a nice transformation! 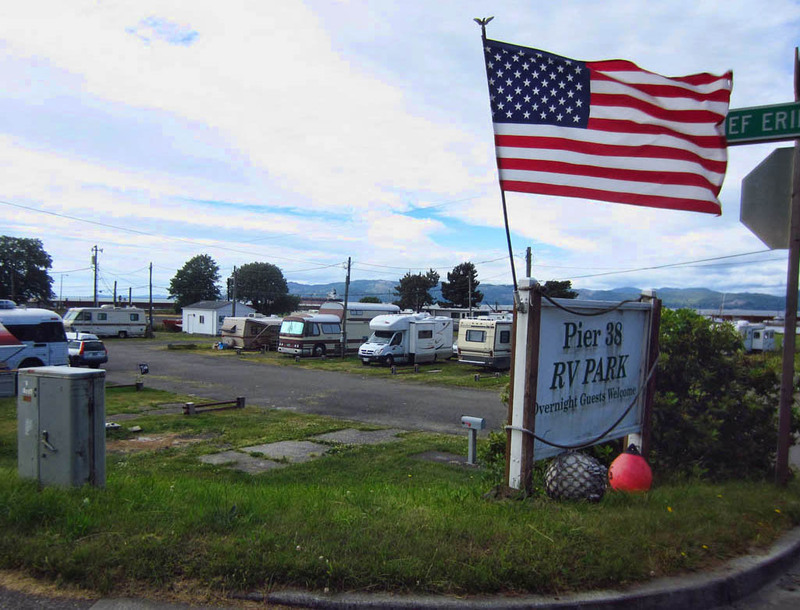 We stayed at Pier 38 RV park recently and found it very comfortable and easy to get into town. 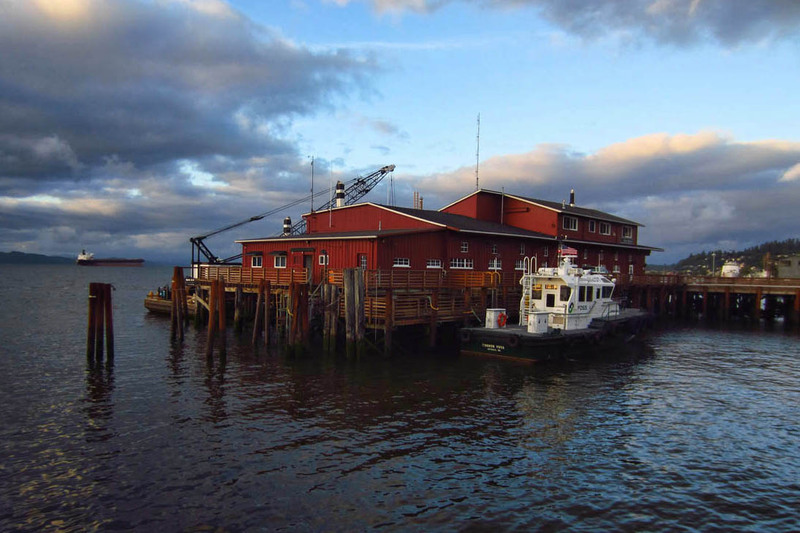 Be sure to bring earplugs because the hundreds of sea lions that have taken up residence on docks by Pier 38 create a cacophony of sound-delightfully part of the Astoria experience! 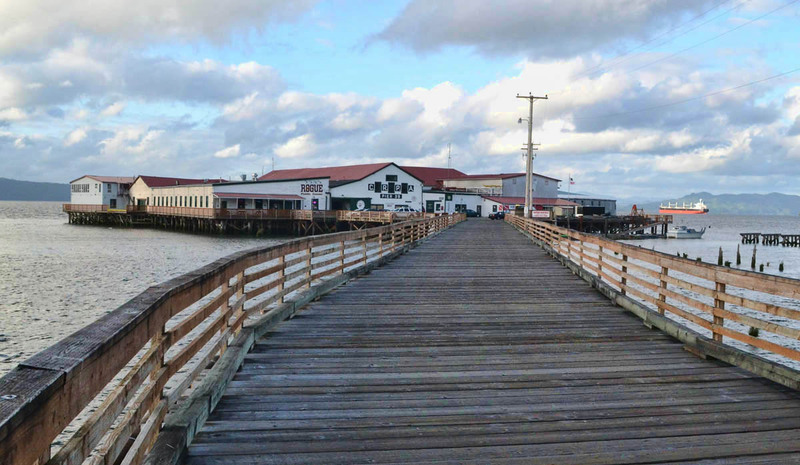 While there be sure to visit our friends Sue and Kurt at Four Winds Canvas shop directly across from the Rogue taproom on the pier-also a nice museum inside the old cannery building dedicated to the area’s extensive cannery history. Buoy Brewing in town has a window set in the floor where you can observe sea lions camped out below on pilings.